Browse: Home / msf-auxiliarys updates : collection of msf auxiliary module. 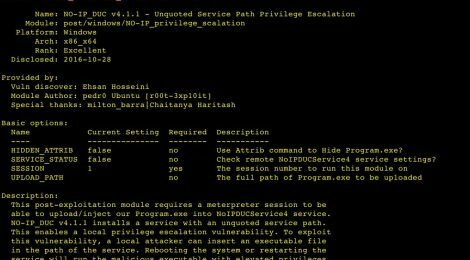 + deploy_service_payload.rb – deploy_service_payload.rb uploads your payload.exe to target system (DEPLOY_PATH) and creates a service pointing to it (SERVICE_NAME). + persist_priv_Wsearch.rb – This post-exploitation module requires a meterpreter session to be able to upload/inject our payload.exe into WSearch (windows search) service. 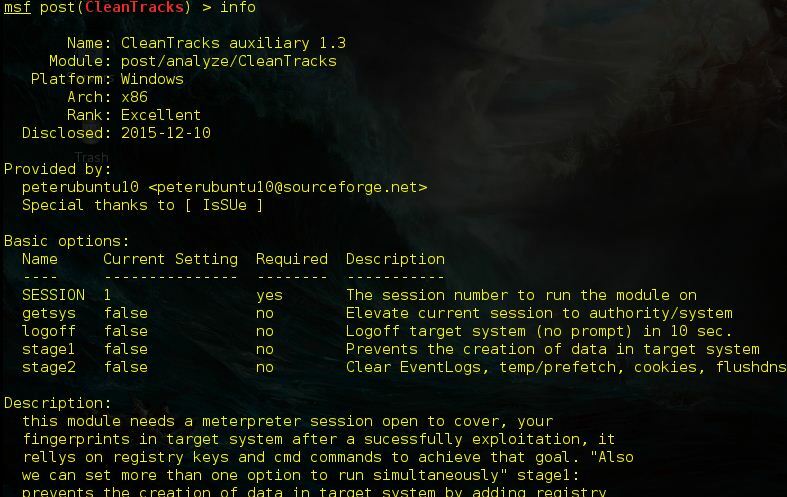 CleanTracks.rb auxiliary as writen to work in post-exploitation (after the target gets exploited and a meterpreter session pops up), it rellys on policies registry keys and cmd commands (remote executed by auxiliary) to cover footprints left in target system. stage1: prevents the creation of data in target system by adding registry policie keys into target regedit, this module should be run just after a sucessfully exploitation. stage2: clear temp/prefetch folders, flushdns cache, clear eventlogs this module should be run befor leaving the current session also we can only use stage2 without runing stage1 but it will be more uneffective that runing the two stages separately. (stage1 and stage2) logoff: logoff target machine (optional, more effective). ← Swissnet – The swiss army knife of net utilities and penetration testing.